CAD Forum - Easily share your Fusion 360 design. Easily share your Fusion 360 design. You can easily share you 3D models in the CAD/CAM application Autodesk Fusion 360 with collegues or communities - either publicly or behind a password. Open the Data panel (left) and right-click on the requested model. 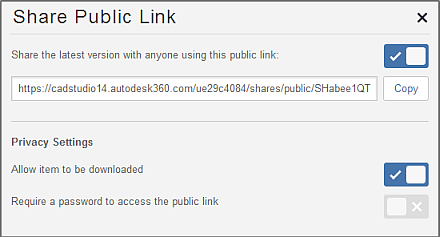 Choose "Share Public Link" from the context menu. In the following dialog then copy the unique URL address with access to your design (web 3D viewer) and specify whether you also want to allow downloading of the model in the source format .F3D and in CAD exchange formats and whether it is password-protected. The visitor will be able to choose from multiple CAD formats for the download: Fusion360, Inventor2014, DWG, DXF, IGES, STEP, SAT, STL and FBX. 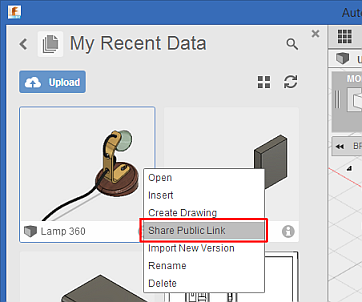 A similar sharing can be also initiated from your project (cloud repository, hub) in Autodesk A360. Tip 11365: How to store Fusion 360 models directly to Fusion Team projects? Tip 11277: How to share simulation results from Fusion 360? Tip 9965: How to create a 360° spherical panorama of your CAD model? Tip 9528: Using Autodesk Fusion 360 as a CAD converter. Tip 8852: Publish interactive 3D models on the web with Autodesk 360. Selected tip: How to display 4 grips in the corners of MText? Missing (closed) status bar in AutoCAD, « | » Commenting models in A360 Team.